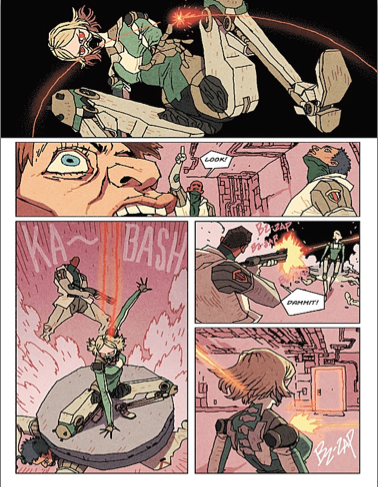 Out today from Archaia is HaloGen, a new sci-fi miniseries written by Josh Tierney and illustrated/lettered by Afu Chan. Now I know what you may be thinking (maybe): another sci-fi comic? It's true, there are a ton of them out there these days. 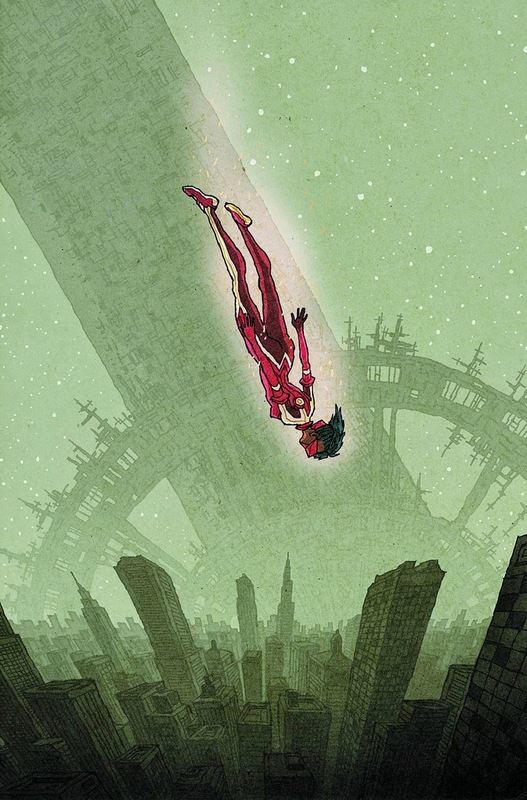 Since Image has had such success with series like Saga and Black Science, it seems like every week there's a new science fiction series with varying degrees of success. 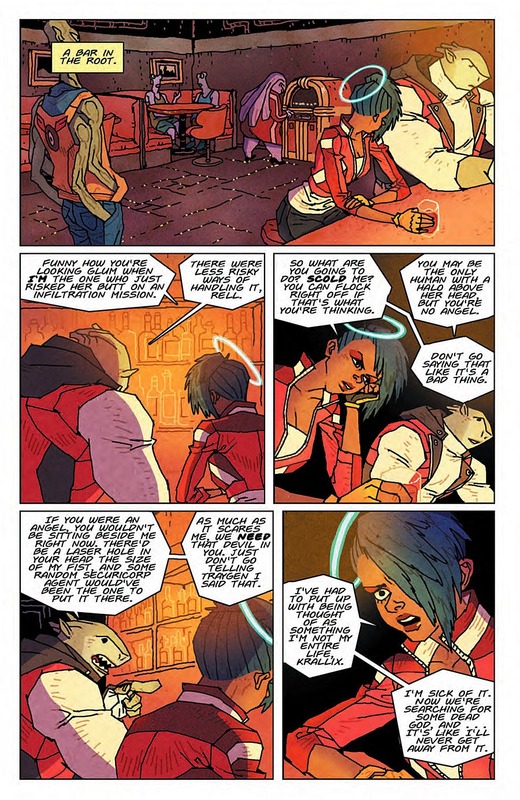 After noticing the gorgeous cover by Chan and reading up a bit about the genesis of the series, it became clear that HaloGen could potentially cut through the noise with something really unique. The story takes place on Cityship Q, a giant space station that has two cities on opposite sides of its coin-like shape, one rich and one poor. This is a world in which five years ago, the dead body of Det'houva, a god believed to have created all biological life, entered our galaxy as was prophesied by a mysterious suicide cult. Cut to modern day and we meet our protagonist, who has just returned from an action packed mission of spying and corporate intrigue. She is named Rell, and the first thing anyone notices about her is the blue halo that hangs at an angle over her head. She possesses the unique power to project realistic holograms, and uses this ability to help a company Halogen investigate the location of the corpse of Det'houva. There are some intriguing ideas here, but the execution in the storytelling is borderline flawless. Rather than pull us in with several pages of action, we instead learn about this world almost completely through dialogue. 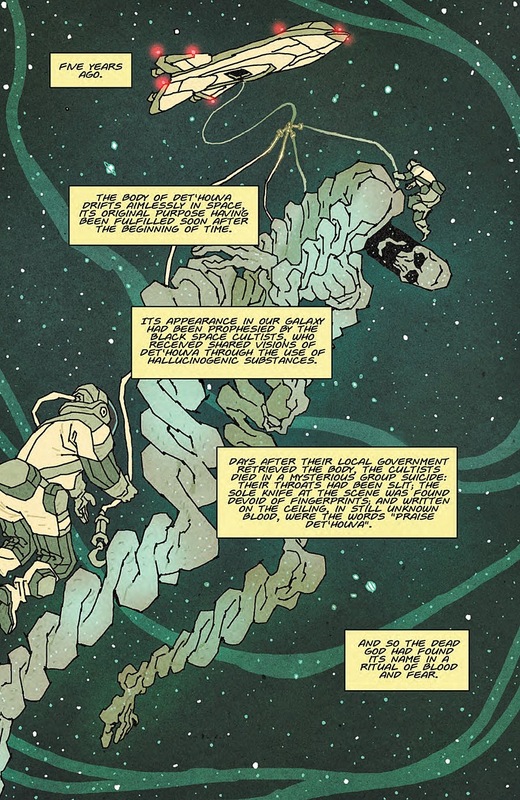 Outside of the first two pages that shows and explains the concepts of Det'houva and Cityship Q, there is no narration whatsoever, a wonderful rarity in modern comics that seek to give us every character's inner thoughts in an attempt to be clever. Tierney truly follows the 'show don't tell' model, and the reveals about Rell, her powers, and her personality come about very naturally rather than in a blast of exposition. Knowing that Giannis Milonogiannis of Prophet fame is a co-creator explains a lot about the concept, but perhaps that fact is even more strongly reflected in the art by Afu Chan. While it looks a bit like Milonogiannis' art, Chan has his own unique flavor of stylish flair, riding a line that falls just barely on the side of western comic art. There is a lot of use of wild, geometric lines, but there's a smoothness to it too that breathes life effortlessly into the characters. The colors by Shelly Chen are equally crucial to the great presentation, looking more than a little like Prophet in it's bold palette. The fact that we begin with character driven scenes that eventually give way to a short but gorgeous action-sequence works even better for the art than for the story as it builds up to Rell's mission to rendezvous with a rogue robot to exchange data on Det'houva's location. In just a first issue, Tierney, Chan, and Chen have created a world and a group of characters that I am instantly invested in. Rell is a great female protagonist, smart and reserved but kickass, all established through her interactions and reactions and not through tired inner monologuing. Within this first chapter some large and fascinating themes are hinted at, from religion as a tool of introspection to how we literally and figuratively represent ourselves to others. It almost goes without saying that Archaia has produced a beautiful object in this issue from cover to cover, and I'm thrilled to have found a new series and set of creators to explore and watch!